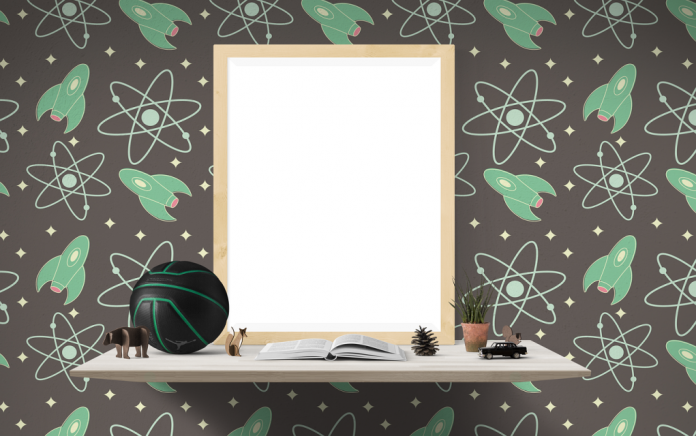 Is your son’s bedroom in need of a makeover? 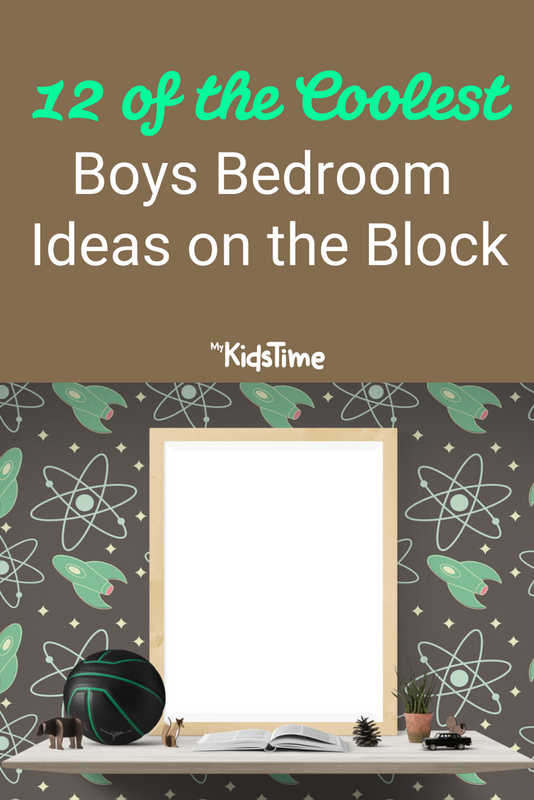 Here are 12 of the Coolest Boys Bedroom Ideas on the Block, guaranteed to up his street-cred and have him and his mates, running to his room! Most are DIY, and lots are space -saving, so crack open the paint tins and start creating inspirational spaces. 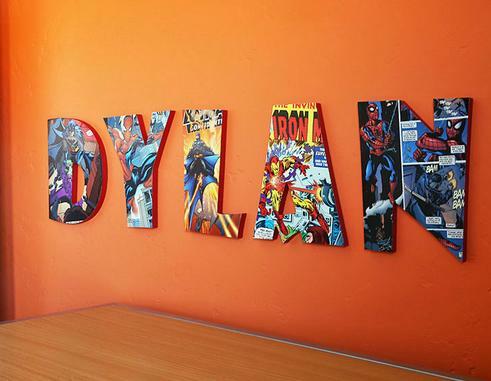 This is a lovely idea from Craftcuts.com: creating comic book (or magazine) letters from your child’s name and then using them as wall art. 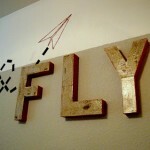 Alternatively, your child could design their own art to create the letters too. It doesn’t always have to be their name either – perhaps they’d prefer to feature their favourite superhero and then it could be ever-changing. 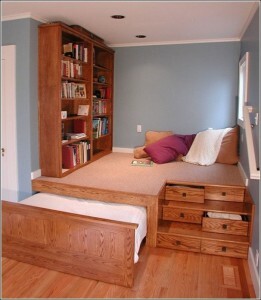 Not only a funky bedroom idea, this is also a neat space saving idea, if the bedroom isn’t that big. This platform design has a bed that rolls out and can be tucked away during daytime but it also incorporates bookcases and storage drawers. The main platform is then a hang out space with cushions and beanbags, where your kids and their mates will definitely want to chill! 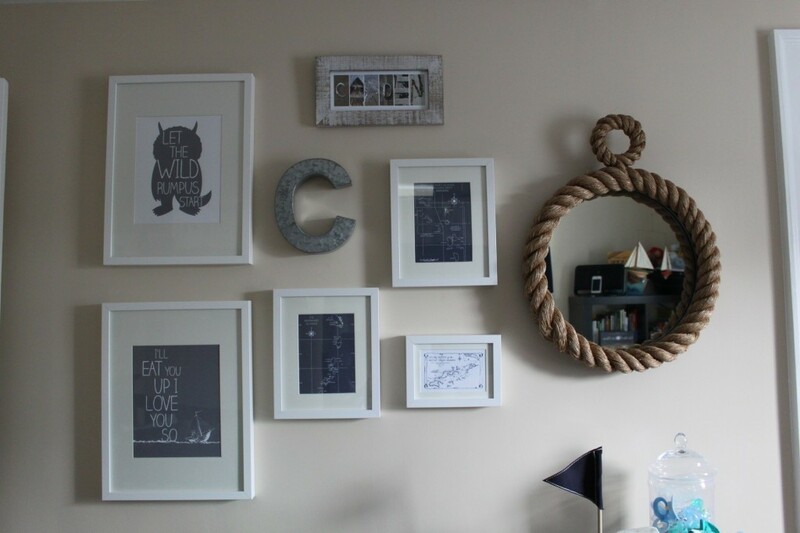 You may also like 14 Glorious Girls Bedroom Ideas that Aren’t Pink, if decorating for a girl. 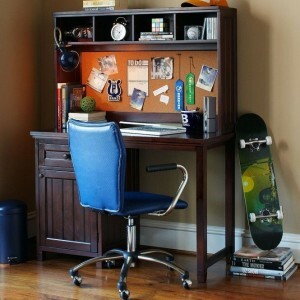 Add extra functionality to a bedroom desk with a bright pinboard at the back which also saves having the pinboard on another wall space, and keeps everything neat and in the right place. 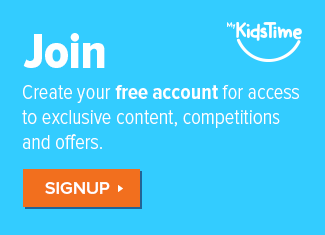 They can pin reminders or just fun stuff that makes them happy. You parents can also sneak in at night, and pin a note while they sleep to surprise them when they wake up in the morning?! 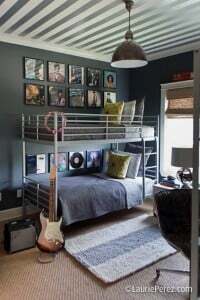 You may have got rid of bunk beds when they were younger but reconsider them for a teen room, as they save space and your teen will often want to have a friend stay over. The striped ceiling with dark walls works really well in this teen room, with a contrasting striped rug on the floor too. 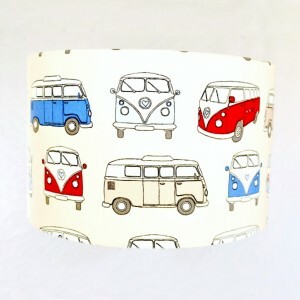 This would suit the “dark wall phase” that your teen may go through – we’ve all been there! 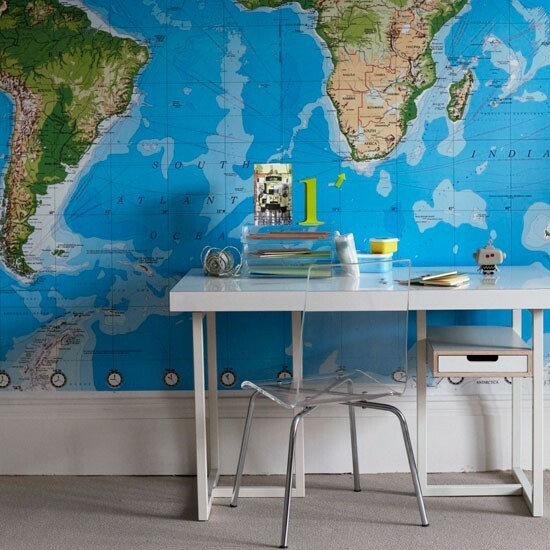 In this children’s study area, this eye-catching map wallpaper creates a lovely feature wall, and brings a fun educational element to the room. The modern white desk and clear acrylic chair allow the map to take centre stage, yet bring a touch of designer style to the space. The map will be a helpful resource for your child for schoolwork, and they could also pin/mark any destinations they have been, to serve as a nice reminder of vacations/trips abroad. Perfect for the child that loves the sea and all things boats, this Nautical design from Project Nursery includes boat lamps, striped curtains, rope mirrors, anchors hooks, nautical pillows and lots more. All sources are listed on the link so you can find them easily. Your child can continues to add to it too, with shells and other keepsakes they find on the beach. 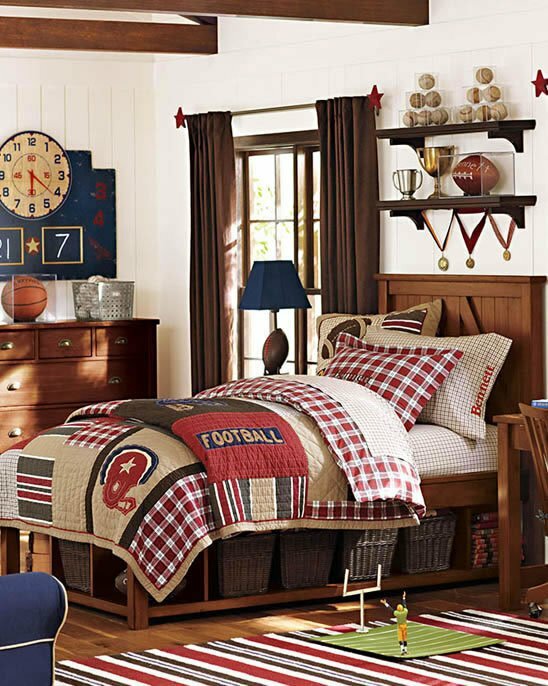 Here Pottery Barn Kids shows how to celebrate your son’s individuality by showcasing his interests, whether football or superheroes, karate or model airplanes. Applaud his achievements by putting his hard-earned awards, artwork and trophies on prominent display. Gather your child’s prized collections together and display them in small vignettes around the room, but do keep in mind that collections have a tendency to grow and grow, so plan extra space. If your boy is into airplanes then this is the room for him. 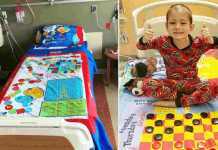 There are some great ideas from Kim at Too Much Time.com which aren’t that expensive either, and if he enjoys making model airplanes, he might even have his own model airplanes to add to room too. There are several memorabilia and also new aircraft that can be utilised to create the theme. And if he grows out of the phase then it is easily interchangeable. This “Mom! 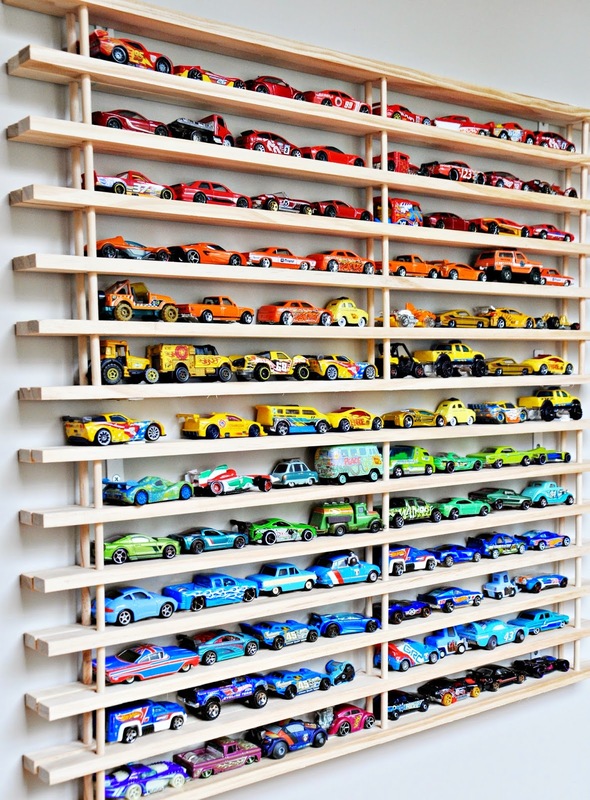 Where’s my car?” wall garage is designed to be convenient, customised and made with high quality materials, and would be perfect for boys who have lots of toy cars. Cover as much space on the walls as it takes to create a “garage” for all the cars in the playbox. 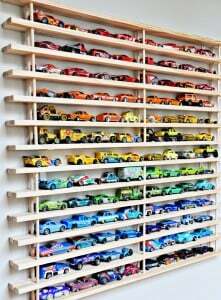 You can hang your way to a toy car clutter free floor. Another way to get those pesky little cars from under your feet and looking neat on the wall for easy access too. 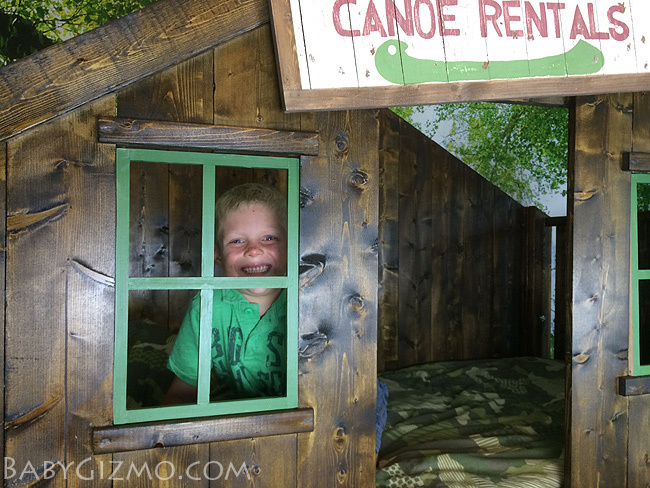 Babygizmo shares a video on how to create this cool Clubhouse room for your boy’s bedroom. This unique room design has plenty of cool features from the custom-made bed and wall mural, to the DIY desk and under bed hammock, to ensure it’s a kid’s dream room come true. By bringing the outdoor tree house inside, it’s perfect for those in a cold and wet climate, and your child will love helping you build it. 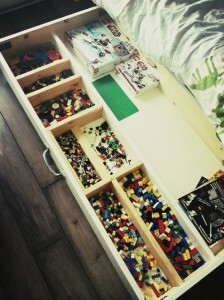 This is a great blog post about creating underbed storage perfect for lego, small cars, or whatever your son is into. Over to you! What have you done in your son’s bedroom that was really effective? Tell us your best boys bedroom ideas in the comments below. Previous articleWe made the Semi Finals of the OMIG Awards!